We recently took the plunge into using Kubernetes to orchestrate containers for a number of our web and data-ingest services. While we have been generally pleased with the experience, we have found metrics, monitoring, and logging to be major pain points for us. Kubernetes provides no out-of-the-box system for centralized logging, so we had resorted to scanning log files on individual pods with a lot of guess-and-check work in matching server logs to application behavior. Without any human-readable interface for viewing application metrics, it was really hard to construct a story describing why an application behaved the way it did. Scheduling behavior – which nodes are the pods put on, and are we scheduling optimally? Some of this information is available with the Kubernetes dashboard add-on, but the data only displays for a short period of time, and the dashboard UI doesn’t provide the level of customization we need to get real insight into our application behavior. After spending some time looking into available monitoring solutions, it quickly became clear that some version of the Elastic Stack is the way to go for us. It’s very well-documented with broad community support and an advanced feature set. Plus, pricing for the hosted service is very reasonable, which means I don’t have to worry about maintaining the stack itself. The only downside was that we had no idea how to get Kubernetes application metrics into Elasticsearch. I was really overwhelmed trying to answer this question. There are so many different tools that were unfamiliar to me — Elasticsearch, Kibana, Logstash, Beats, cAdvisor, Fluentd, Heapster, Kubernetes internals. I didn’t know where to start. Finally, I ran into some documentation about an Elasticsearch “sink” for Heapster. This was the magic bullet I needed to get started. If you’re unfamiliar with Heapster, as I was, it’s a tool that collects metrics from Kubernetes and ingests them into any number of backends (“sinks”). Now we just need to create an index pattern for Kibana. 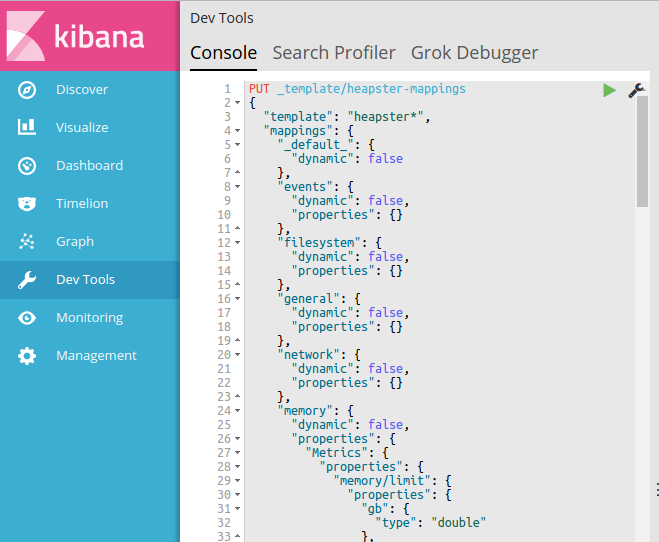 You can do this from the Management > Index Patterns console in Kibana. Heapster uses separate timestamp fields for each metric type, which makes it difficult to visualize the data with Kibana. We’ll merge the fields into a single Timestamp field. Heapster logs Kubernetes labels as a single string, which makes it difficult to run queries against label values. We’ll split the labels field up separate fields for each key-value pair. Heapster logs memory in bytes and CPU usage in millicores. Nothing wrong with that, but sometimes it’s nice to work with larger units. We’ll add fields for memory in Gibibytes, and CPU in cores. How are we going to do all this? Ingest pipelines to the rescue! Heapster will restart, and all new data will be transformed via our new ingest pipeline. By default, Elasticsearch creates data-type mappings dynamically. I learned the hard way that this can be more of a headache than a time-saver. If the first report of the day has your CPU usage at an even 3.0 cores, Elasticsearch will call that field a long. Any floating-point values ingested after that will result in mapping conflicts. Mapping conflicts make that field unavailable for queries. And since resolving mapping conflicts is a real pain, we’re going to setup our mappings right off the bat. Lucky for you, I created a mapping template for you: heapster-mapping-template.json. If you want to create your own, just run GET /heapster*/_mapping to see the existing dynamically-created mappings and tweak it to your needs. I won’t go too much into application logging, as this will be specific to your use case and environment. But we decided to send log data directly to Elasticsearch using Winston, a Node.js logger, rather than running Logstash or Fluentd to collect container logs. It just seemed a lot more straightforward for us. If you do want to try collecting logs from your containers’ stdout, running a Fluentd DaemonSet seems like the way to go. 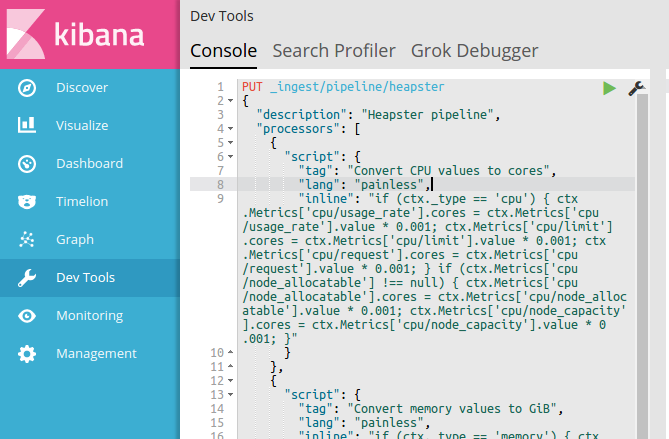 It took a bit of playing around, but we’ve managed to create some nice dashboards in Kibana. Easily conduct A/B performance tests against new features, leading to major performance improvements. It took a bit of effort to get going, but the payoff was certainly worth the investment. Any chance you will be sharing your dashboards? Your solution is pretty much nice and short. Really impressive. I am also trying to configure with AWS elasticsearch. But i stuck here in the integration of Elasticsearch and heapster. Do you have any idea about it, can you share your knowledge please?